Do you want to learn about astronomy secret and learn more about science? Melaka is known for its planetariums and this is one of the place you should go to educate your child and yourself. Melaka Planetarium Adventure Science Centre is second planetarium built in Melaka after Al-Khawarizmi Astronomy complex . If Khawarizmi situated in the village area, Melaka Planetarium is located in the center of Melaka International Trade Centre (MITC). Take a look at the map below. 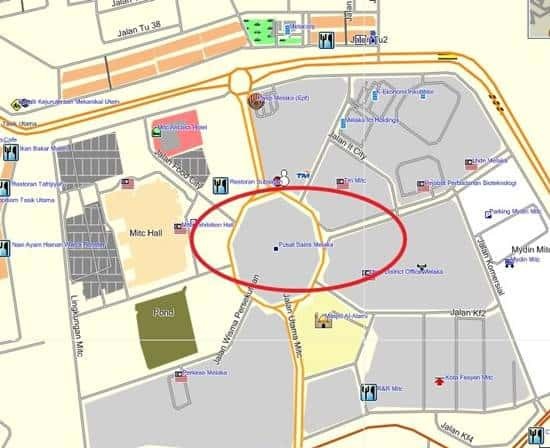 It is exactly in the center of the main of MITC. It is only 4 km from the Ayer Keroh toll plaza and there are many attractive places to visit nearby such as Zoo Melaka, Crocodile Park and Mini Malaysia. 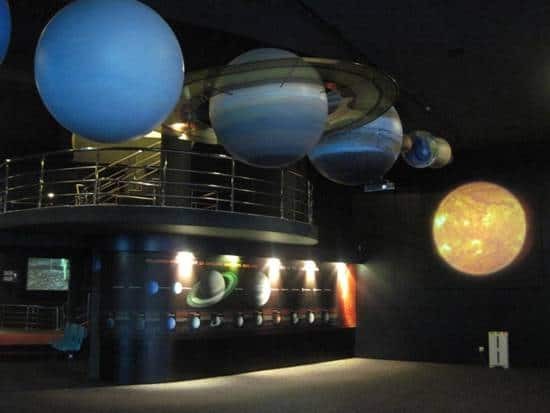 Melaka Planetarium aims to infuse the joy of learning the astronomical concepts and its connection with a wide range of discipline including; physics, biology, chemistry, mathematics, psychology, geography, literature and history. The idea to build this planetarium came from the Melaka State Chief Minister, Y.A.B Datuk Seri Haji Mohd Ali bin Mohd Rustam after he visit Adler Planetarium in the United States. The architecture of Melaka planetarium building is unique. It is built based on Islamic architecture and a landing UFO, and it has 3 floors. The Melaka Planetarium Adventure Science Center is built on 0.7 hectare land and it is the biggest planetarium in Asia. It is measured up with a world class planetarium, exhibition hall and furnished with animation equipment that allows 200 viewers to enjoy video film on astronomy. The planetarium offers visitors a glimpse into magnificent cosmos and information about astronomy using the latest technology. There are many attraction places such as Challenger Simulator, Galaxy Gateway, Spacecraft Model, Hubble Space Telescope, satellite and many more. The most attractive exhibition is 3D Space Theater. The sophisticated space theater is equipped with the best audiovisual technology that will make visitor amazed with the show. The theater will make you experienced the real time 3D computer graphics, astronomical simulations and full dome video. There are many range of 3D films available including educational that suit for everyone whether it is for children or family. Not just exhibition, there’s also a program conduct in the Melaka planetarium especially for student such as fun with science and science kids. The program will bring educational for student to learn about science in fun way. Let’s go the Melaka Planetarium and explore the unexplored. I m sure you will learn something new. I am writing on behalf of world renowned planetarium manufacturing company Carl Zeiss, Jena, Germany. Please let me have the email id of the concerned person for discussing about upgradation of your planetarium. Please refer the email and website written in the blog post above.